HARRISONBURG — Randy Bailey had been in his new home for less than a week. But with his mounted, six-point buck on one wall Thursday and pencil drawings by friends Bruce Dellinger and Ken Schuler beginning to fill the rest, his living room at Bellaire at Stone Port was starting to reflect the 81-year-old’s personality. Bailey is one of the first residents of the new senior care facility off Stone Spring Road. The first five moved in a week ago, and 20 people were expected to be calling Bellaire “home” as of Friday. Bailey said he decided to leave the facility he was living in when complaints weren’t addressed, and he’s glad he did. Such compliments are just what Kim Pack wants to hear. The facility’s executive director has embraced the rare opportunity to build a staff from scratch. 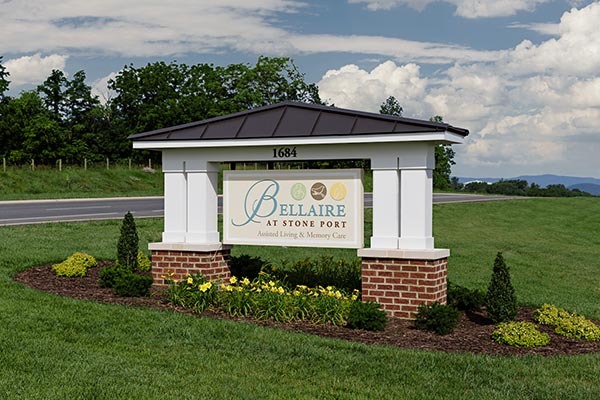 Bellaire was built by and is owned by Cathcart Group, the Charlottesville company behind The Reserve at Stone Port apartment complex elsewhere in the Stone Port mixed-use development. It contracted Cummings, Ga.-based Beacon Communities Inc. to manage the facility. Early interest in the facility has exceeded expectations, marketing director Cindy Dove said. The staff has taken 49 deposits for apartments and expect to have at least 31 residents moved in within the first month. Though occupancy was projected to be 65 by the end of the year, Dove said she thinks there’s a chance the facility will be full by then. Assisted living apartment rents range from $3,600 a month for a studio to $6,000 a month for a two-bedroom unit. Memory care apartments are $4,900 a month all-inclusive, with a guarantee that annual rate increases will be 5 percent or less. The complex has a number of in-unit and community-area amenities. Each assisted living apartment has a kitchenette with granite countertops, while memory care units have a partial kitchenette. All bathrooms are handicap-accessible. Residents can control their own apartment temperature. The facility has any array of communal features, including seven living room areas where residents can gather with family and friends, four activity rooms, a movie theater, a cafe/bistro, three enclosed courtyards, indoor and outdoor dining areas, regular and Wii fitness areas, a therapy room and a woodworking room. Staffers prepare meals in a state-of-the-art kitchen. Technology is interwoven into the facility. The complex has wireless Internet access, rooms have keyless entry systems, and staff members are alerted if an exit door is left open. Nurses on every shift also deliver medication to each resident. Pack, who holds a bachelor’s degree in health care administration with an emphasis on long-term care for seniors from Mary Baldwin College and has 10 years of industry experience, said Beacon has been responsive to ideas to improve the facility. The complex has about 30 employees, said Pack, but its workforce will be about 80 when it’s at capacity. Both women trained at Bellaire at Devonshire, a nearly identical Cathcart-owned, Beacon-managed community outside Charleston, W.Va.
Cathcart CEO Todd Dofflemyer said Thursday that the company has exercised an option on land with the intent to expand Bellaire at Stone Port, but no plans are definite at this time.